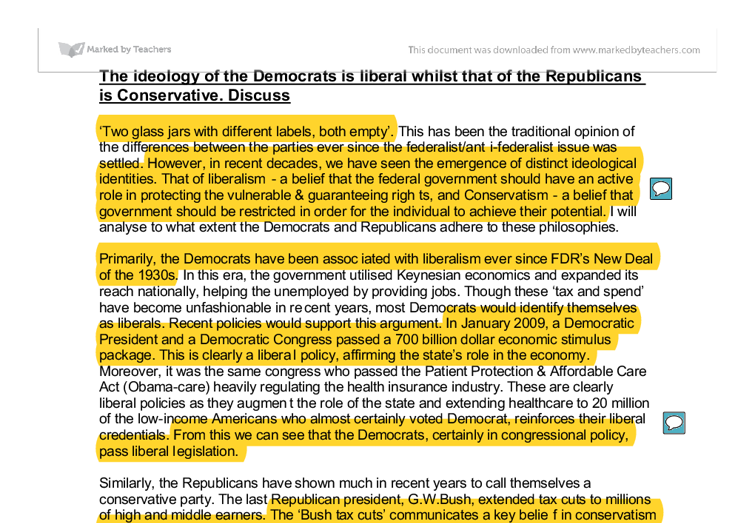 The ideology of the Democrats is liberal whilst that of the Republicans is Conservative. Discuss 'Two glass jars with different labels, both empty'. This has been the traditional opinion of the differences between the parties ever since the federalist/anti-federalist issue was settled. However, in recent decades, we have seen the emergence of distinct ideological identities. That of liberalism - a belief that the federal government should have an active role in protecting the vulnerable & guaranteeing rights, and Conservatism - a belief that government should be restricted in order for the individual to achieve their potential. I will analyse to what extent the Democrats and Republicans adhere to these philosophies. Primarily, the Democrats have been associated with liberalism ever since FDR's New Deal of the 1930s. In this era, the government utilised Keynesian economics and expanded its reach nationally, helping the unemployed by providing jobs. ...read more. We can therefore see large cleavages between the beliefs held between the parties, the Democrats attempt to pas liberal policies whilst Republicans try to pass conservative ones. In addition, Bush relieved the role of the Federal Government in some public utilities to the voluntary & private sector as part of his Compassionate Conservatism agenda. Again, this is an example of republican conservatism as it reduces the power of the government. More evidence supporting this can be found within Congress. Though Congress used to be bipartisan with the party line carrying little weight amongst senators and congress people, this is no longer the case. So far in the current congressional session, party unity has been around 92%. As congress lacks the strict whipping system found in the UK parliament, one can argue that the unity is down to the distinct beliefs of the parties- conservatism and liberalism. ...read more. Bill Clinton, though initially attempting ambitious healthcare reform, declared the 'era of big government over', balanced the federal budget and passed social security reform. These can be said to be more conservative, even, then liberal. Similarly surprising, although Bush made large tax cuts, he also presided over the alrgest increase in the federal budget since LBJ's Great Society and he also extended the role of the Federal Government through the No Child Left Behind Act. We can therefore see that recent administrations of would-be liberal/conservative presidents have proved to be a mixed bag - not strictly adhering to either ideology. It is undeniable that the Democrat Party is liberal and the Republican Party is Conservative. However, the extent of this is far from 'clearly' cut. The nature of the US federal government means that differences will always exist within the parties - though this has been reduced in recent years. In conclusion, I believe that, broadly speaking, the two parties have distinct ideological identities however, there is still evidence to rebuke this and so therefore I agree mostly with the statement. ...read more. Overall this is a good essay. 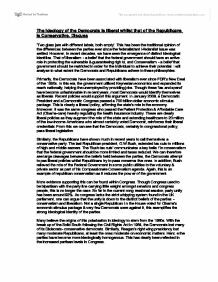 It covers the arguments as to why the Democrats can be seen as liberal and why the Republicans can be seen as conservative well, using good examples to back up the points being made. However, despite the good elements of the essay it is slightly one sided. More emphasis is needed on why the labels of liberal/conservative might be too simplistic to describe the two main parties. By structuring the essay differently, with an argument supporting the statement followed by a counter argument, a more balanced argument would ensue. Outline how and why federalism has changed since the 1960s. But in over a 1000 times a President has vetoed legislation Congress has only managed to pass it on 10 occasions. The judiciary can review any decision made by any section of government and deem it unconstitutional. It can also interpret the constitution. in Europe; and Prussia's concern with French attack, proves their conflicting aims. When there is no common purpose and when each and every one wants something different other than controlling Europe, it's very hard for an unorganized congress system to succeed. The Constitution pays careful attention in defining where certain powers lie. In particular it does a clever job of dividing certain powers between the state and federal government. Also there are specific division or separation of powers between the three branches of the government. &amp;quot;Presidents have only the power to persuade&amp;quot; discuss. The most important power a president has is the power to appoint Supreme Court judges. This gives a president the chance to have their image in place for a long period of time, after they are president. Some presidents are lucky enough to appoint a lot of judges like Raegen and bush, who together appointed 5 of the 9 justices. The power to limit government through the separation of powers can be demonstrated in the case of Brown v Board of Education, in 1954. The Supreme Court ruled that state laws establishing separate schools for black and white students, were unconstitutional. The power of the President is limited to the power to persuade. Discuss. of Kennedy?s tax legislation, and Gerald Ford convinced Congressman Mitchel to support his jobs bill when he agreed to prevent the closure of an air base in his constituency. When a President is particularly desperate, running out of time, or facing a widespread loss of party support in Congress, he may go directly to the media.